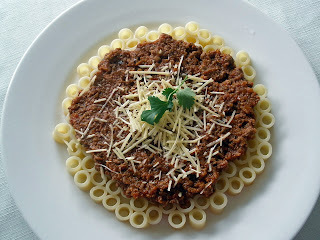 I do agree bolognese taste better with spaghetti but I like them with rigatoni....I like how the sauces filled up the holes of every rigatoni. Yes people, I have issues with pasta, if that's what you're wondering. I only like very few pasta types, rigatoni being one of them. This was made when Aaron went camping. As you could see from the picture, I took all the effort to make each and every rigatoni stand upright for the sake of my blog. I thinkthey look very picturesque, somewhat like beehive, apart from the fact that it's not hexagonal! I shared this with housemate, Su En too and she got all ecstatic and told her colleagues ''my very nice housemate is making something really good for lunch and she said it's pretty time consuming!" and when they ask her what's all the hoo-ha about and she told them it's bolognese, they kinda responded in a sarcastic tone, '' hey, that's not tough!''. My secret recipe includes chicken livers and rindless bacons added into it to give the extra ooomph! I was also self-taught that nothing breaks up lumps better than using a whisk in making bolognese. It's a messy affair making them, don't talk about eating! Top it up with a handful of parmesan and you're ready to spoon in! p/s: it's a total of 18 ingredients making them if you consider the 2 types of oil used in the picture! Also added a dash of nutmeg and dash of grounded cloves! I like the way you arrange your pasta.